Has the original Starrs & oni 167 welcome screens. From a stock oni 167 mod. Today let me show you guys this theme, inspired by shinobi ninja. Configuration 3 click to unlock. Please use and feel, then let me know your review. I made a this theme for my Billet Boxes. I hope you like it! An 8bit ish pokemon theme made by me, enjoy. Turk Kullanıcılar için Menü türkçeye çevrilerek yeniden düzenlenmiştir. 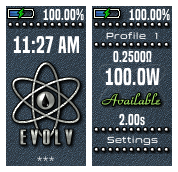 This Theme was created to be a complete theme for any DNA device you may have. 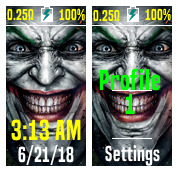 It is simple, clean, and was originally created to be a general use alternative to the stock Galeon Theme provided by Vaporshark. Included above are several Theme Sets for Galeon, and General Evolv Chipset Mods. Below is the Asset Pack, Containing all Screens, Both Large and Small, Welcome Plates, and Profile Screens. Also Included is a Readme, documenting all current features. Thank you for the download. I created this theme in honor of Hotline Miami from Dennaton/Devolver Digital, Two theme files are attached for ease of use. Below, I have the full folder and asset pack available. Hope You Enjoy it! 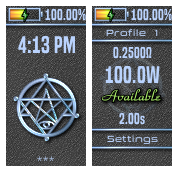 This is my first custom theme and is intended to fit into a SteamPunk setting. 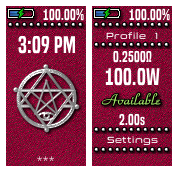 I used the Steam Engine's default theme and left the logo intact, since the term can apply to any personal vaporizer, but I reworded the screens and designed them using Victorian principles, grammar and typefaces. The first thing I did after receiving my new Steam Engine is backup the theme. This is it. You ever miss the old days? Here's a slight reminder of your youth, packed into a theme! Legend of Zelda fans rejoice with this beautiful tribute to Nintendo's greatest. All icons interact and work accordingly, The iconic 8bit heart is your battery meter. Hope you guys enjoy it as much as i liked putting it together. Simple and clean. Just like the mods. Enjoy. Please leave a review of different things you think I can do to further better this theme. Thanks. Packed in all the features on Escribe that are ( i think ) relevant. Replay screen is an original invention of my own to make it user friendly. see the changeling for updates. Hi! RastaVaper here - this is a new theme I've been tinkering with to accomodate my DNA250-C, designed for simple, intuitive access to the boards deeper functions. I decided to upload this for everyone - few tweeks have been made, any bugs or error's/feedback please feel free to get hold of me through the evolv site - or drop me an email! Potentially might update this, change colour schemes and add further deeper functions... see how well this downloads first! Any features you would like personally, just let me know! I also accept any private requests, want me to build you a theme just for you? Taylor it exactly how you would like it? Get hold of me, why not! I enjoy it. Dual main screen, custom graphics, rainbow LED light, battery analyser, board stats, annotated menus/screen items, there's quite a lot to explore. Hope everyone enjoys, happy vaping! Comprehensive menu system. All features included....i think ! 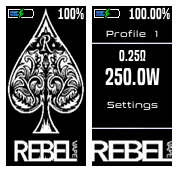 Theres only really one way to do the 250C menus which incorporates all the different styles 250c offers.. TC, Wattage and Replay and i think this is it. I'm not a big fan of the icon style setting menus, you can't make great icons in a 20x20 space. With that in mind all of my themes contain exactly the same menu system and only the artwork differs. I am not even close to being an expert so i'm open to comments on how to make the menus better. Also if you have a request for the main lock screen icon that tailors to your favourite mod / atty i'm willing to give it a bash. include a colour too if that matters to you, i find darker themes with white menus work better. 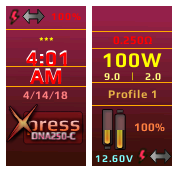 DNA250 BOLD LARGE FONTS THEME, added Adjust Boost Punch picture for latest firmware. This theme uses LARGE BOLD FONTS to increase legibility. it can be used for DNA non color boards. individual pics also attached as zip file. 1st Attempt at a 250C theme. My Paranormal hasn't arrived from ecigone yet. so it's untested. I didn't change the working too much it's mostly an artwork project. Later attempts will probably try to utilise the massive amounts of options in eScribe. Let me know about bugs and stuff ill sort them quickly.